The Gastonia was discovered relatively recently and named in 1998 by James Kirkland. It was named after Robert Gaston the discoverer of the genus. 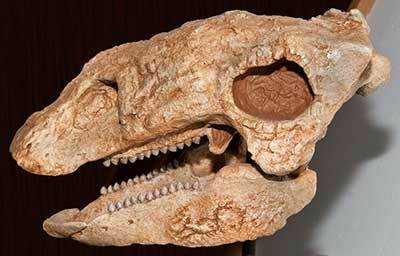 It was first found in the same quarry as the Utahraptor in Grand County Utah. It later became the first dinosaur to be mounted in the Denver Museum of Nature and Science. A lot of material exists for the Gastonia, however, due to the many spikes and dis-articulated material found in the bonebeds it has proved difficult to tell how many spikes the dinosaur actually had. The Gastonia is closely related to the Polacanthus and resembles it with its sacral shield and large shoulder spikes. The beast was heavily armored and had short legs making it difficult to attack. Its head contained a mobile brain-case perhaps for shock absorbance in case of head butting in a confrontation. The Gastonia was certainly on the menu for the fierce Utahraptor, but its armor would have made a kill very difficult as the Utahraptor would have had to flip the animal on its back exposing its fleshy belly. Copyright © 2005-2010 Calvin & Rosanna Hamilton. All rights reserved.